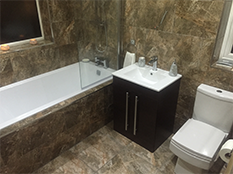 Bathroom renovation using compact bathroom fixtures, Woolton L25. Our pictures show amazing results at our clients home in Woolton, L25. Just in time for their new arrival! The installation of a 1300mm bath wall to wall makes this bathroom compact but very practical and stylish.